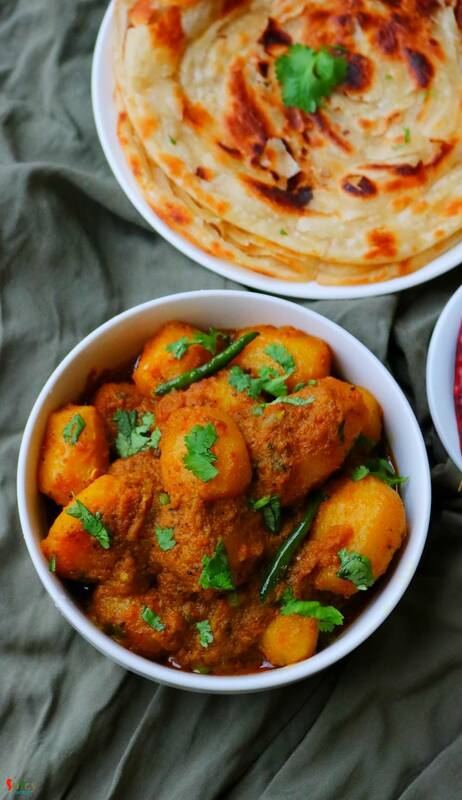 Aloor Dom is a very good old Bengali recipe which can never go wrong with anything. 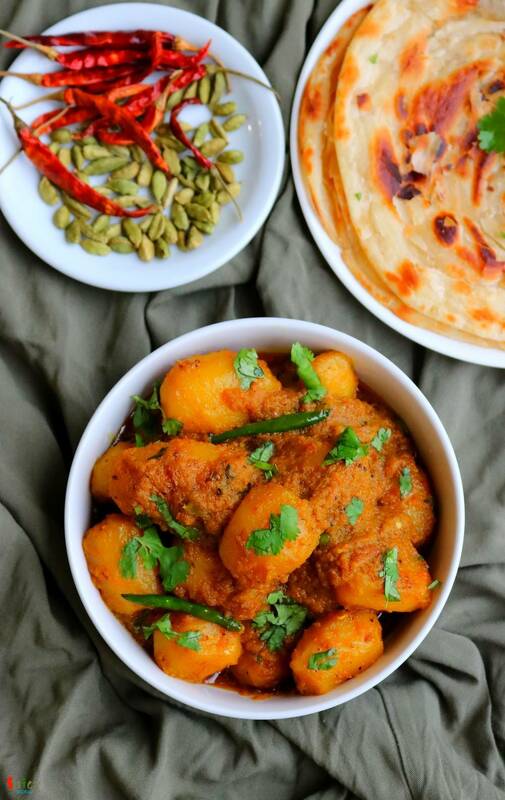 You can serve this Bengali style dry Potato curry with Luchi / Porota / Kochuri / Pulao / Fried rice and what not. It tastes heavenly. I made Lachha Parathas to go with it. 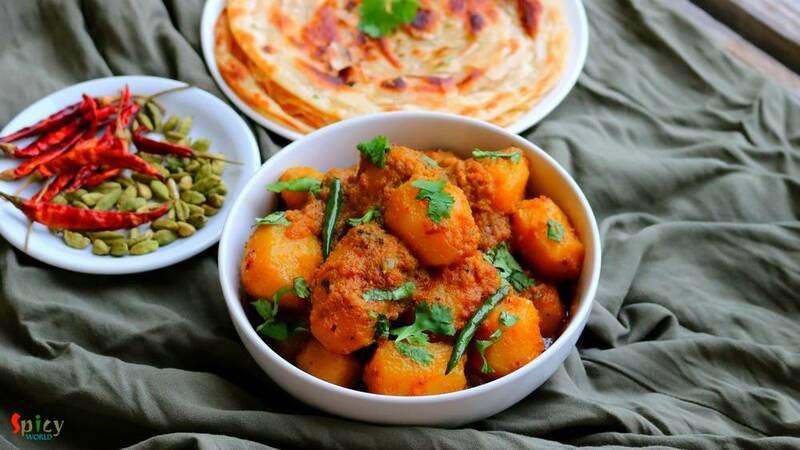 The recipe of Aloor dom is very easy in which potatoes will be cooked in onion tomato based gravy along with a special ground masala and yes, this freshly made ground spice is the main key to create the authentic taste of Aloor Dom. In winter grocery market will be filled with baby potatoes, this recipe will become more attractive if you can use them. Being a Bengali it is my pleasure to share this particular recipe with all of you lovely folks. It's time for you to enjoy the recipe with video. 1 big onion, roughly chopped. Whole spices (2 Tablespoons of coriander seeds, 1 Tablespoon of cumin seeds, 2 dry red chilies, 1 Tablespoon of black peppercorns, 4 green cardamom). 1/3rd cup of mustard oil. Dry roast the whole spices in a pan for 5 minutes on low flame. Then grind them to a semi coarse powder. This is the Aloor Dom special masala powder. Make a smooth paste out of onion, ginger, garlic, tomato along with little water. Add the onion tomato paste and cook until oil separates. It will take around 10-12 minutes. Then add turmeric powder, red chili powder and 2 Tablespoons of that dry roasted powder. Mix well for 2-3 minutes. Then add the peeled and washed baby potatoes. Mix well for 5 minutes on medium flame. Add salt and sugar as per your taste. Mix well. Then add half cup of hot water, cover the pan and cook until the potatoes become soft. After that add green chilies. chat masala, 1.5 Tablespoons of that dry roasted powder or garam masala and ghee. Mix well. Add some chopped coriander leaves and turn off the heat. Your kosha aloor dom is ready to serve. 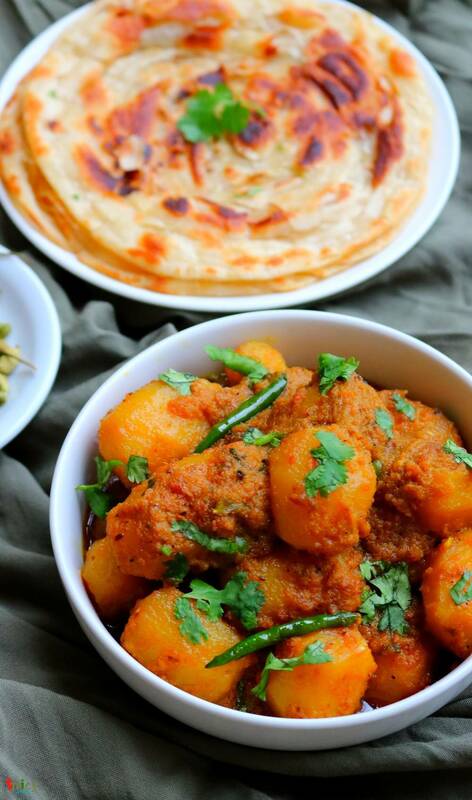 Serve this hot with kochuri, lachha paratha, basonti pulao or luchi.